Although it’s not one of Montenegro’s top tourist destinations, Podgorica can be a fantastic base from which to explore Montenegro. Its central location is ideal for discovering the country’s mountains and coasts in day trips, while the vibrant capital has plenty going on by night. Here are six fantastic day trip itineraries to explore Montenegro from Podgorica. Skadar Lake is one of the largest bird reserves in Europe and a day trip here is both awe-inspiring and offers an excellent insight into Montenegrin history and culture. The lake is a beautiful body of water, with large open spaces and reed canals, which shelter a multitude of wildlife. A boat trip through the lily pads visits the former prison island of Grmožur and the ruined fortress of Lesendro. Further afield, the island monasteries are cultural highlights offering both stunning scenery and the chance to try some monastery-brewed rakija (brandy). Around the lake, biking and walking tracks offer fabulous nature and views. This area is also Montenegro’s top wine-growing region and a visit to a local winery, like Eco-resort and Winery Cermeniza, is the ideal way to try local wines, more rakija and traditional delicacies, like marinated carp from the lake. 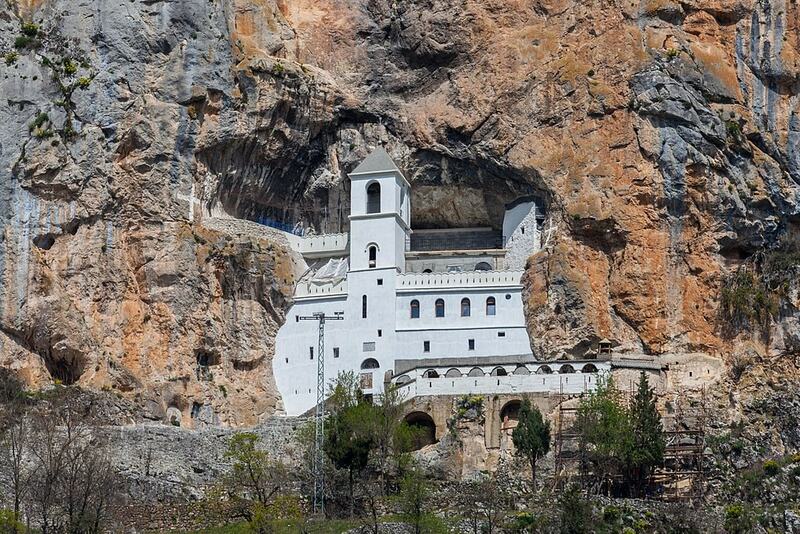 Ostrog Monastery is one of the most revered holy sites in the Balkans and one of Montenegro’s top attractions. The 17th-century monastery has lower and upper monastic buildings, but it’s the upper monastery that’s the main attraction. The gravity-defying monastery is built into the side of a cliff, high above Bjelopavlići Plain. To get the best out of a trip to Ostrog Monastery, park at the lower monastery and take the forest path to the upper monastery. The upper monastery has two cave churches, one housing Saint Basil’s relics. The views over the plain and Zeta River from here are stunning. In summer, a trip to Ostrog Monastery can be rounded out with a refreshing dip in Nikšić’s Krupac Lake. On Sundays, a kilo of carrots is the price of entry to Martinići Donkey Farm, a donkey sanctuary and farm. Try their donkey milk products, which are sold as far away as China and the United Arab Emirates, and meet the donkeys up close. A trip up the Morača Canyon from Podgorica to Biogradska Gora National Park is a stunning drive. Follow the winding canyon through Montenegro’s namesake mountains to this forest getaway. Biogradska Gora is one of the few remaining virgin forests left in Europe. Take a walk around the lake or follow one of the hiking paths. Along the way, Morača Monastery is an idyllic monastery where a waterfall shoots out into the canyon below. Mrtvica Canyon is another stunning hike that can be done on this day trip, and Montenegro Animal Sanctuary is a fun and unique up-close encounter with a range of wild, farm and former circus animals. The glittering Budva Riviera is the perfect day trip from Podgorica. For the best views, take the scenic route past Skadar Lake and then along the coast. Stop in Petrovac’s pretty Mediterranean township, visit Sveti Stefan and walk through Miločer Forest, then continue up the coast to Budva. Budva’s old town is over 2,000-years-old and a buzzing tourist destination. Explore the old town and take the seaside path to Mogren Beach, then finish up the day at one of Budva’s top restaurants. See some of Montenegro’s most important cultural and scenic sites on this day trip through old Montenegro. Between Podgorica and Cetinje, Lipa Cave has guided tours through the karst cave system. In Cetinje, Montenegro’s old royal capital, attractions include Montenegro’s national museum, King Nikola’s Court, the Bilijarda, Cetinje Monastery and the Blue Palace. As well as housing interesting artefacts, these historic buildings make up some of Montenegro’s most beautiful architecture. Onwards into Lovćen National Park, there’s a small hike of 461 steps to Petar Petrović-Njegoš’ mausoleum, which rewards visitors with 360-degree views over all of Montenegro. Ivanova Korita is the ideal picnic and walking spot, and there’s a tree-top ropes course for real adventurers. The descent down the serpentine road, with its 25 hairpin turns, is one of the most impressive drives in Montenegro and offers unrivalled views of the Bay of Kotor. Kotor’s Venetian, walled town is one of Montenegro’s must-see attractions. The old town’s charming alleyways weave through old piazzas and past old churches. Hiking San Giovanni Fortress, before returning to Podgorica via Budva, completes the ultimate old Montenegro day trip. Intrepid travellers love to head down Montenegro’s south coast to the ancient towns of Bar and Ulcinj. Bar old town’s colourful streets and mosques show the influence the Ottoman Turks left behind. Bar is known for its thousands of ancient olive trees. The grandfather of them all is Stara Maslina, thought to be the oldest olive tree in the world at over 2,000-years-old. Similarly, Ulcinj’s old town is 2,000-years-old and one of the oldest settlements on the Adriatic. It overlooks the town’s Mala Plaža (Small Beach), an idyllic cove of golden sand. But for a real beach day, head to Velika Plaža (Big Beach), a 13-kilometre stretch of sandy beach that’s a popular kitesurfing destination. Montenegrins love ulcinjska lubenica (watermelon from Ulcinj) in summer, so grab a fresh watermelon at a roadside stall to finish the perfect day on the southern coast.